Home / About us / Latest news / Why do periods come early or late? 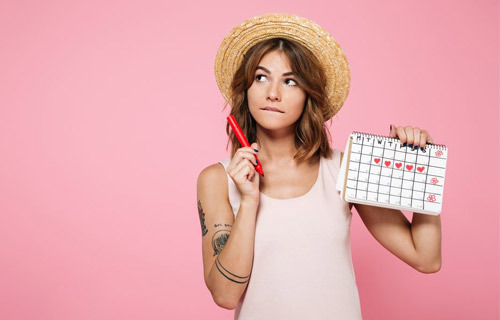 Periods are not an exact science and they can always appear a bit earlier or later than the expected date. The reason is that the menstrual period normally lasts between 21 and 35 days and it is regulated by hormones whose functionality could be altered by different factors. So, even if there will always be somebody affirming that her period runs like clockwork, normally it’s not like that. As a matter of fact, only 30% of women has regular cycles for most of her fertile life; the others have longer (more than 35 days) or shorter periods (less than 21 days) and 10% of these cases is “irregular” or “variable”. Moreover, it is completely normal if a period is up to one week longer or shorter. Anyway, if irregularities are constant, the bleeding is abundant, the period doesn’t come for three months or it is more frequent than usual you should talk to your gynaecologist, in order to check that everything is fine. Stages of life with hormonal changes or imbalance. Other possible causes: some common disease, tumours and ovarian cysts can also provoke menstrual disorders. Most of these problems have a treatment and they can be mostly solved or kept under control. What really matters, then, is always consulting a specialist, in order to prevent these problems from extending or affecting our health and quality of life.